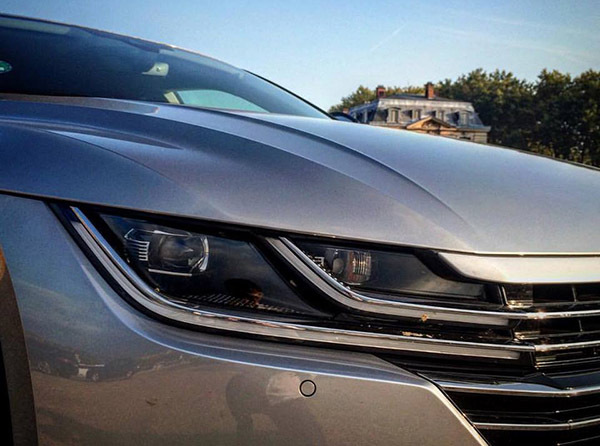 Burlappcar: VW Arteon sighting . Yes, while I was in Europe last month, I saw the new VW Arteon. Just parked there. So I took a coupe of pictures of it, mainly for my Instagram account. It does look really good in person. I can't wait to see it at the L.A Auto show next month. And even drive one later. It will be quite a cool battle between this and the Kia Stinger in a few months. Really interesting to see 2 near luxury hatchbacks competing in the US. Kind of resemble a Panamera! A VW FWD car cannot compete with an RWD car. Stinger can beat Arteon in almost any category. Is it possible this is built on the same platform as the new Audi A5 4 door Sportback? Great looking especially in profile. That front end shot makes me think of Accord but perhaps not in person. I hope it's a hatchback, because I'll replace my CC. 90% of car buyers will not care, at all, if a car is FWD or RWD. Although I am sure that car magazines who will take both cars on the tracks will see a difference, but not the real potential buyers. VWs are usually great driving cars, and I am sure this one is too. And yes, as I mentioned, it IS a hatchback. Got an Arteon rental car while I was there. I really liked it. Great handling and nice infotainment system. Also like it's a true liftback makes cargo space lot better. Note this will slot above the Passat in terms of pricing. Probably will start at 35K next summer. It is same platform as A5 sportback afaik. Note it may not be RWD (like almost everything in this category) but there is also an AWD model. I did drive that one (4motion) and had pretty good grip and acceleration. There is an uncomfortable amount of current Malibu in that c-pillar. . .